After completing my Masters degree in Applied Geomatics I moved to Ottawa and worked for the federal government for several years. I started out as a contractor with the Department of National Defence doing general GIS and mapping for the Vancouver 2010 Olympics, but eventually landed a permanent position in geospatial intelligence. 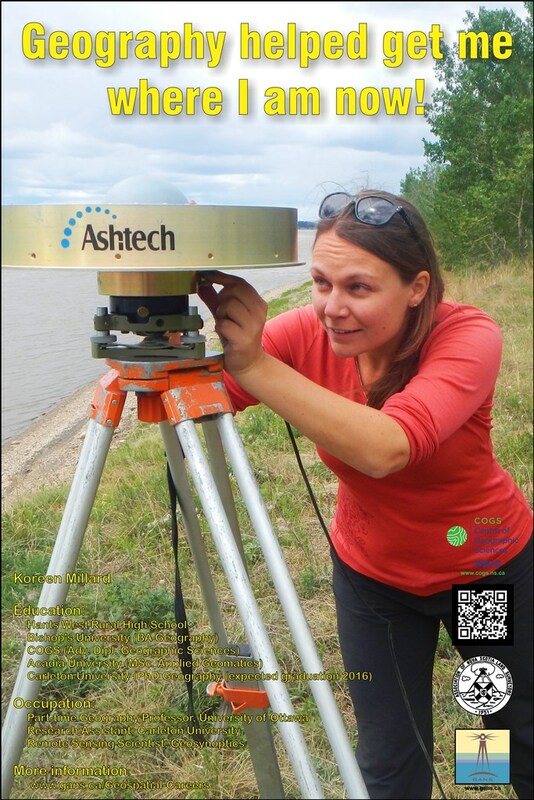 This field of work was very far from what I studied in school (remote sensing of salt marshes) and I eventually switched jobs to the Canadian Centre for Remote Sensing where I was working on remote sensing of wetlands with Synthetic Aperture Radar (SAR) data. I then decided I wanted to go back to school yet again and do a PhD in remote sensing at Carleton University. Since moving to Ottawa I have also been teaching geomatics part time at the University of Ottawa and do small consulting/contracting jobs on the side through a start-up company, Geosynoptics. Through my PhD research I travel to northern Canada several times per year and I also study the peatlands near Ottawa as I can visit them frequently. For the past three summers I've spent several weeks visiting different types of wetlands in burned and un-burned sites in Wood Buffalo National Park where we measure several different aspects of trees (e.g. height, density, foliar moisture etc). At this site I am providing help to the Canadian Forest Service on mapping of forest and wetland types for forest fire fuel prediction. At the Debeers diamond mine in Northern Ontario I am focusing on mapping soil moisture and water table dynamics in different types of peatlands (e.g. bog and fen). I have spent the majority of the last two summers at Alfred Bog in Eastern Ontario. My field crew and I trudge through the bog on snowshoes (so we don't sink in as far) and monitor soil moisture and water table coincident to SAR (RADARSAT-2) acquisitions. In addition to wetness, vegetation and surface roughness affect the SAR signal, so therefore we also have to collect measurements of vegetation. This can be difficult and time consuming so we are also developing methods of using a UAV and Structure from Motion to map these variables. As moving throughout the bog is difficult and slow, all of my field work requires a team of people to work together in order to acquire the number of measurements we need. We generally don't see any other people while we are working in the bog. We do see lots of interesting wildlife though (moose, bears, spotted turtles, sand hill cranes)! I usually spend my winters processing all of the data that was collected in the spring, summer and fall. I mainly use commercial software for remote sensing data processing, but am beginning to rely on open source statistical software (R) for analysis. This requires me to create my own scripts for data processing and analysis.